Nathaniel Hood rejoices over the discovery of John Ford's Bucking Broadway (1917), one of the director's fabled lost collaborations with actor Harry Carey. 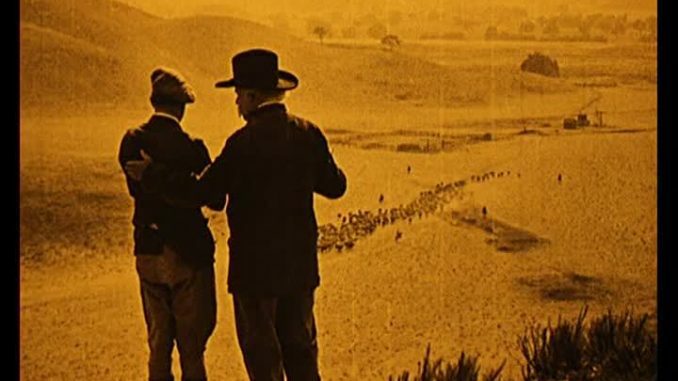 In all of film history, there are few greater tragedies than the fact that only a handful of the 60-70 silent films directed by John Ford still survive to this day. Ford, one of American cinema’s greatest innovators, myth-makers, and poets, amassed one of the most astonishing bodies of work of any director, one of tireless creativity, daring, and inventiveness. The re-discovery of any of these titles is an occasion for celebration. 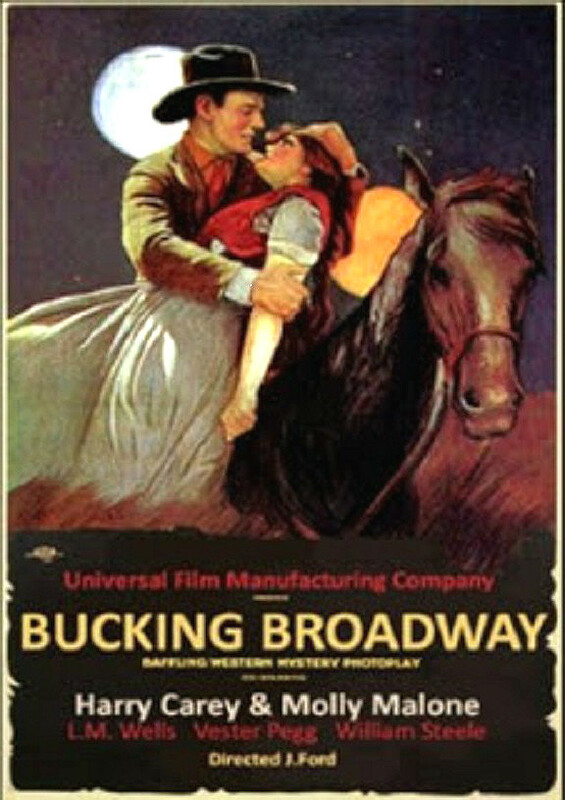 But the rediscovery of Bucking Broadway (1917) in a French film archive in 2002 was especially momentous: it was one of Ford’s fabled 25 lost collaborations with actor Harry Carey. 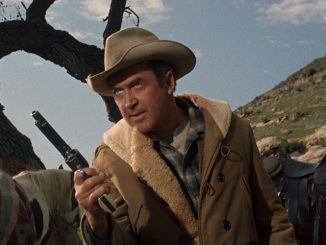 Ford and Carey were one of the original great Hollywood actor/director partnerships, long before Ford’s later partnerships with John Wayne, Henry Fonda, and Will Rogers. In Bucking Broadway, Carey plays Cheyenne Harry, a Wyoming cowboy who falls madly in love with Helen Clayton (Molly Malone), his boss’s daughter. But before they can get married, Helen is whisked away to New York City by Eugene Thornton (Vester Pegg), a highfalutin’ businessman who woos her with candied words and promises of wealth and social status. But when Eugene reveals himself to be a drunken lecher, she contacts Harry who races to the big city to save her along with his fellow cowboys. One of the first things you recognize in Bucking Broadway is the relative understatement of the performances. In the late 1910s, the melodramatic histrionics of D.W. Griffith and the ebullient overacting of Douglas Fairbanks reigned supreme in Hollywood. Yet the central performances here are relatively subdued, especially the one given by Carey. 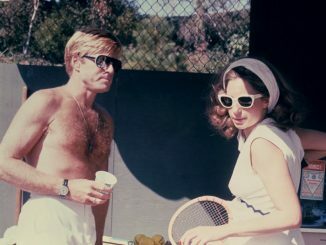 Here he demonstrates a kind of stoic gentleness, a machismo tempered with introspective tenderness. One of the first scenes of Carey and Malone together sees him carve a tiny wooden heart for her with a giant knife, his tough and grizzled hands struggling to chip away at the tiny piece of wood. Later when he asks Helen’s father for her hand in marriage, he can’t stop nervously twisting his feet on the carpet. And when he takes Helen to see the house he built for the two of them, he can’t bear to look her in the face until she takes his hand. Wayne was occasionally capable of quiet scenes of tender emotion, but none of this magnitude. In another decade, Carey’s character would probably be dismissed as a sissy. At only 53 minutes, it’s astonishing how little of Bucking Broadway is actually dedicated to the plot. Instead, Ford seems more concerned with character moments and comedic vignettes about the clash between the isolated, blue-collar world of the cowboys and the encroaching modernity of the twentieth century. As opposed to the majority of his work which triumphed the spread of civilization against the lawlessness of the frontier, here the world of cities and technologies is an alien one, a world by turns frustrating, amusing, and terrifying. When an automobile races by the ranch-house, all the ranch hands rush to the window and gape in open-mouthed wonder. When Carey travels to the city to rescue Malone, he mistakes the hissing of an hotel heater as a rattlesnake and nearly scares the valet to death when he whips out his six-shooter. The film climaxes with one of the most powerful images of Ford’s early career: a group of cowboys racing down the streets of Manhattan to rescue Malone. It’s the perfect summation of the clash between old and new, the traditional and the technological. But one scene towers above the rest of the film. It happens about halfway through when the cowboys discover a piano at the boss’s ranch house. One of them plucks away at the keys with a clumsy finger, and an inter-title tells us he’s playing a bittersweet song about wanting to go home. The weather-beaten, hard-living cowboys begin to break down and cry. We, the audience, are meant to read this spontaneous outburst of emotion as comical. But immediately afterwards, Carey and Malone’s father get the telegram telling them she’s eloped to New York City. Devastated, the father collapses into himself and weeps. Shell-shocked, Carey tries to comfort him. As Carey carries him out of the room, one of the cowboys starts playing the tune a second time. But now, nobody cries. Nobody has to. Here we see Ford achieve an unexpected emotional reversal the likes of which elude most modern filmmakers. It’s pure Western poetry, a moment of poignant, tragic beauty that would remain an undercurrent through Ford’s future work. At the very end, we’re left with a simple question: if such an insignificant film in Ford’s career could contain such depths, how much more are we missing in the 60+ of his films still MIA? It’s a question that should keep every respectable cineaste up at night. You can watch Bucking Broadway for free right here!